When the erection of the Albert Institute was contemplated, Mr John Symers went readily into the involvement and was one of the earliest and largest subscribers. His first subscription was £1000 and he afterwards supplemented it by a donation of £500. Western Cemetery, Perth Road, Dundee. Section X Lair 29. Church of Scotland, St Marys (East Church): John Symers was upwards of twenty years an elder in the East Church. He subscribed liberally to the different schemes and particularly to the erection of the Mission Schools, latterly organised by the Rev A Watson. John Symers' commercial career was commenced under Patrick Anderson, formerly Provost of Dundee. Soon after this, he entered the offices of Messrs Symers & Anderson, who were the agents for the British Linen Banking Company in Dundee. Mr Colin Symers was his elder brother and on Mr Anderson withdrawing from the agency about 1817, Mr John Symers was conjoined with his brother in the management of the Bank. This arrangement did not last long because Mr Colin withdrew from the bank agency to devote his time to being a Collector of Customs. Mr John Symers carried on and business increased greatly under his care for nearly forty years. 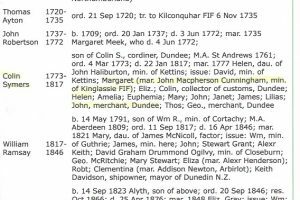 John Symers was the 13th of 15 children born to the Reverend Colin Symers (Minister of Alyth Parish from 1773 – 1817) and his wife Helen (nee Halyburton). 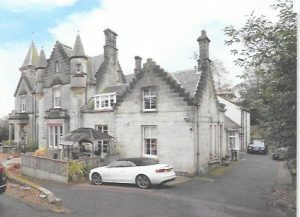 He received his early education at Alyth Primary school and had valuable assistance from his father who encouraged him in his studies. When he was about 15 years old he came to Dundee and was entered as a pupil at Dundee Academy. He distinguished himself for his attention to his classes. Although a number of family members were connected to the ministry, John became a banker with the British Linen Company Bank. The Edinburgh based bank was the only British bank to be formed on the basis of an industrial charter and its roots lay in the linen industry. It first opened a branch in Dundee in 1811. John married Mary Jobson, whose father David Jobson was a collector of County taxes. The family originally lived above the bank in Murraygate, before moving to a large mansion, St Helens on Perth Road. St Helens, next to the Taypark Hotel, has now been divided into flats. When the Symers lived at 77 Murraygate, the 1841 and 1851 census show they employed 3 female servants. One servant, Eliza Cruickshanks (1851 census), remained with the family and is shown in the 1891 census, still working at the family home in Perth Road at the age of 68 years. She was a housemaid while a cook and table maid were also employed. John and Mary Symers had two daughters – Marion Crawford, (named after her maternal grandmother), who sadly died in the year she was born. This is recorded on the family gravestone. The other daughter, Helen Symers, never married and remained at St Helens until her death in 1906, at the age of 75 years. Helen Symers was a generous benefactress to Dundee. Her donations included funding to Royal Victoria Hospital, The Salvation Army Rescue Home and she initiated the Fund for Indigent Females. She gave the site of the Arthurstone Library. She was President of the Dundee Ladies’ Union and office bearer on a number of voluntary organisations. She was made a Burgess in 1899, “in recognition of her many acts of wise beneficence to the City and citizens of Dundee.” University archives record that in 1903: “In accordance with the wish of Miss Symers who has so generously gifted a large proportion of the purchase money, the ground in front of Ellenbank House (south of the University tower block) is to remain an open space for the city as well as the college.” She is commemorated in the name of Symers Street in Downfield. The family have a large ornate gravestone attached to the west wall in Western Cemetery, Perth Road. The right hand memorial ‘window’ records the deaths of John Symers, his wife and two daughters. 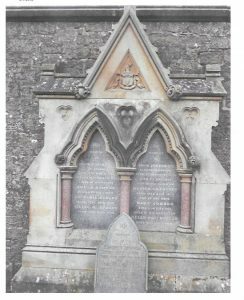 The left hand memorial ‘window’ records the deaths of brother Colin and three sisters Amelia, Euphemia and Lilias, none of whom married. A small headstone in front of the memorial, records the names of Mary Symers’ mother and other Jobson family members. John Symers died in 1866 and his will shows he had become a millionaire by the time of his death. Although being a generous subscriber, (his first subscription was £1000 and he afterwards supplemented it by a donation of £500), he did not live to see the completion of the Allbert Institute. Old Parish Registers. Alyth. Births. (1794). 328/30/147. ScotlandsPeople website. Old Parish Registers. Dundee. Marriages. (1827). 282/ 210 215. ScotlandsPeople website. Recorded on family gravestone. Western Cemetery, Dundee. Old Parish Registers. Dundee. Births. (1831). 282/160 320. ScotlandsPeople website. 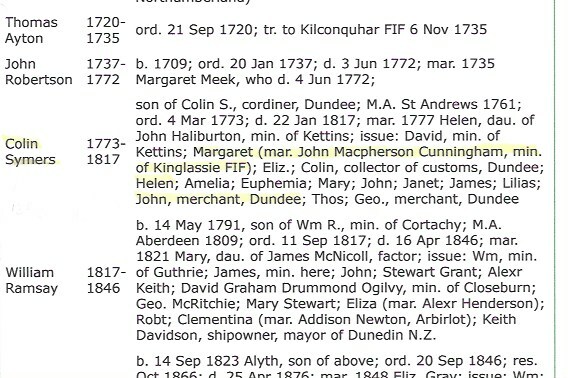 The 1841, 1851 and 1861 Scotland Census. Dundee. Ancestry website. Statutory Registers. Dundee. Deaths. (1866). 282/ 2 550. ScotlandsPeople website. Photograph of grave provided by Christina Howie (Lead Researcher). Obituary. Dundee Advertiser. Thursday, 3rd May 1866. British Newspaper Archives website. Obituary. Dundee Advertiser. Thursday, 3rd May1866. British Newspaper Archives website. Dundee Postal Directory, 1864-65. p.16. 18. 22. 36. Dundee Central Library, Local Studies. Dundee Postal Directory, 1864-65. Dundee Central Library, Local Studies. Wikipedia. The History of Dundee - 1874. Edition of James Thomson's 1874 Work. Statutory Registers, Dundee. Deaths. (1906). 282/ 1 439. ScotlandsPeople website. Legal Records. Wills and Testaments. Dundee Sheriff Court. (1866). Reference SC 45/31/20. ScotlandsPeople website. 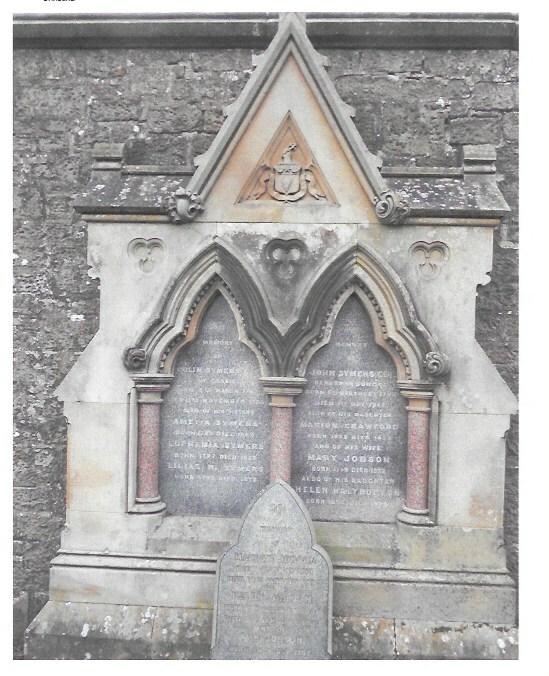 Christina Howie provided the photograph of the Symers gravestone in Western Cemetery. Ann Prescott identified the location of St Helens, the Lodge and stables. The information above about John Symers has been collated from a range of digital and hard copy sources. To the best of our knowledge it is correct but if you are relying on any information from our website for the purpose of your own research we would advise you to follow up the sources to your own satisfaction. If you are aware of an inaccuracy in our text please do not hesitate to notify us through our Contact page.